Video posted to YouTube on Thursday, Aug. 11, 2016, shows two thieves sawing through a tree in Philadelphia's Fishtown neighborhood to steal a bike. The search is on for two thieves seen in surveillance video sawing down a tree in Fishtown in order to steal a bike that had been locked to its trunk. Based on the quality of the execution of this caper, anyone looking for these two bandits can safely skip searching for them at any of the local libraries and colleges. Because as one of the two voices narrating the video put it, "Wow this is pathetic. This is not a big tree guys." Actually, after watching the video, it's impressive either was coordinated enough to ride a bike without training wheels. The video was uploaded to YouTube on Thursday with the title, "Two morons cut down a tree in Fishtown to get my bike." It's five minutes and 14 seconds of footage, and it takes the two suspects every second of the that span to hack, kick and shake their way through the tree's trunk, which appears to be about four inches in diameter. According to the timestamp on the video, the bike was stolen Thursday – the same day the video was posted – just a couple minutes before 5 p.m. 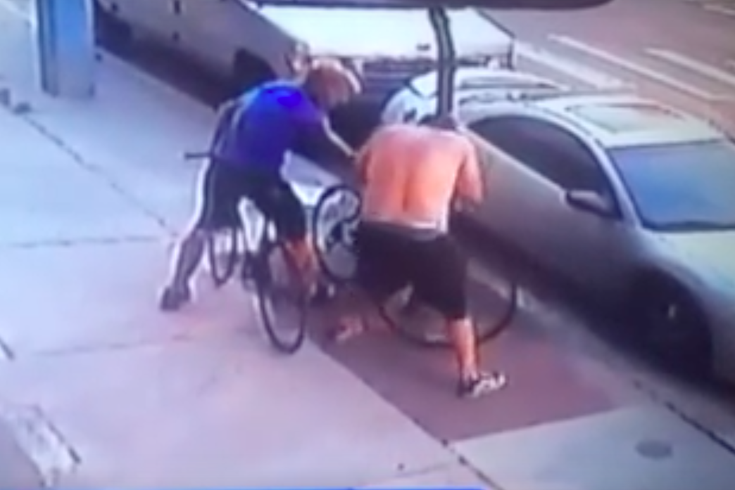 The thieves, one shirtless and the other wearing a blue shirt and seated on a bicycle already when the video beings, both have their faces covered but are otherwise mostly undeterred by passing traffic – including a SEPTA bus. Nor are they seemingly concerned they are committing the theft in the light of day. It's best to just watch the video below, but one highlight stands out. At 1:08 in this edited clip, the guy in the blue gets a running start and takes a flying leap at the tree. Be aware the video contains some profanity, and if you know who these guys are, please call the Philadelphia police.